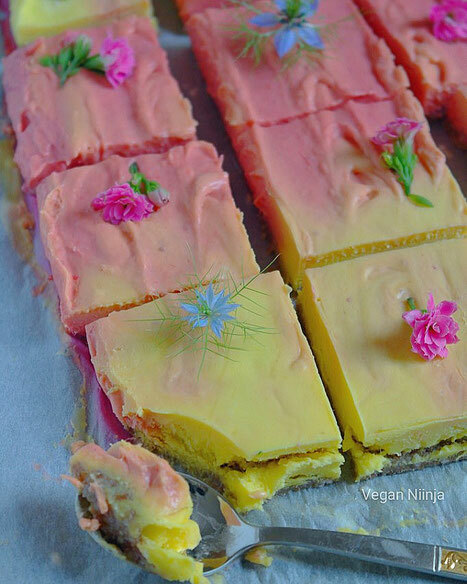 Mango-Raspberry Pastel Cake - Raw, GF, & Nut free - simply & healthy vegan recipes that taste amazing! Sometimes we just need to put all that we love and miss from the summer into a cake and know that the summer will come back sooner or later. This is why I made this creamy berrylicious-fruity and fresh no-bake cake with all the flavours one can wish. With a crispy crunchy crust! You need only a few ingredients for this raw vegan cake and it takes only a few minutes to prepare. Recipe in english and german. Combine the ingredients for the crust in a food processor, and process until the dough sticks together when you press it between your fingers. Press down the dough firmly over the parchment paper. Place the coconut oil, syrup and the mango in a blender and blend until very smooth, 2-3 minutes. Pour 1/2 of the mango cream in a bowl and set aside. Add the raspberries to the mango-cream in the blender and blend it for an other minute until well combined. Spread both the raspberry cream and the mango cream on the crust as you like it, use a spoon to make a beautiful design. Put the cake in the freezer for at least 1 hour (better 3 hours), and take it out 10 minutes before enjoying it. Gib alle Zutaten für den Kuchenboden in den Mixer und mixe bis die Zutaten anfangen, zusammen zu kleben. Lege ein Backpapier auf eine viereckige Form mit Kanten. Drucke den Boden gleichmäßig in die Form hinein. 1 große, reife Mango, je süßer desto besser! Vermische alle Creme-Zutaten außer Himbeeren in einem Mixer auf hoher Geschwindigkeit bis die Masse ganz fein und glatt ist. Dann die Hälfte davon in einer Schüssel gießen und auf Seite stellen. Die Himbeeren zu der Creme im Mixer geben und noch eine weitere Minute mixen, bis die Himbeeren ganz aufgelöst sind. Die Himbeeren und Mango Creme über den Kuchenboden gießen. Mit einem Löffel kannst du schöne Muster gestalten. Stelle die Form für mind. 1-3 Stunde in das Gefrierfach. 10 Minuten vor dem Servieren auftauen lassen. Genießen! Thank you so much dear Asma for your sweet respons!! I am so happy you like my blog and recipes!